Andrew Jackson ( March 15, 1767 – June 8, 1845) was the seventh President of the United States (1829-1837), He was military governor of Florida (1821), general of the Battle of New Orleans (1815), a co-founder of the Democratic Party, and the eponym of the era of Jacksonian democracy. He was a polarizing figure who helped shape the Second Party System of American politics in the 1820s and 1830s. Nicknamed "Old Hickory" because he was renowned for his toughness, Jackson was the first President primarily associated with the American frontier (although born in South Carolina, he spent most of his life in Tennessee). Jackson was born in a backwoods settlement to Presbyterian Scots-Irish immigrants Andrew and Elizabeth Jackson in Lancaster County, South Carolina, on March 15, 1767. He was the youngest of three brothers and was born just a few weeks after his father's death. Both North Carolina and South Carolina have claimed Jackson as a "native son," because the community straddled the state line, and a cousin later claimed that Jackson was born on the North Carolina side. Jackson himself always stated that he was born in a cabin on the South Carolina side, a fact which historians accept, since he presumably was repeating the recollections of his mother and others in the immediate family. He received a sporadic education. At age thirteen, he joined the Continental Army as a courier. He was captured and imprisoned by the British during the American Revolutionary War. Jackson was the last U.S. President to have been a veteran of the American Revolution, and the only President to have been a prisoner of war. The war took the lives of Jackson's entire immediate family. Andrew and his brother Robert Jackson were taken as prisoners, and they nearly starved to death. 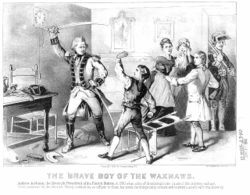 When Andrew refused to clean the boots of a British officer, the irate redcoat slashed at him, giving him scars on his left hand and head, as well as an intense hatred for the British. Both of them contracted small pox while imprisoned, and Robert died days after their release. In addition Jackson's entire immediate family died from war-time hardships that Jackson also blamed upon the British. This anglophobia would help to inspire a distrust and dislike of Eastern "aristocrats," whom Jackson felt were too inclined to favour and emulate their former colonial "masters." Jackson admired Napoleon Bonaparte for his willingness to contest British military supremacy. Jackson came to Tennessee by 1787. Though he could barely read law, he found he knew enough to become a young lawyer on the frontier. Since he was not from a distinguished family, he had to make his career by his own merits; and soon he began to prosper in the rough-and-tumble world of frontier law. Most of the actions grew out of disputed land-claims, or from assaults and battery. He was elected as Tennessee's first Congressman, upon its statehood in the late 1790s, and quickly became a U.S. Senator in 1797 but resigned within a year. In 1798, he was appointed judge on the Tennessee Supreme Court. 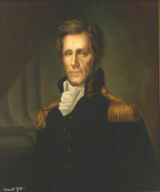 Jackson became a colonel in the Tennessee militia, which he had led since the beginning of his military career in 1801. In 1813, Northern Creek Band chieftain Peter McQueen massacred 400 men, women, and children at Fort Mims (in what is now Alabama). Jackson commanded in the campaign against the Northern Creek Indians of Alabama and Georgia, also known as the " Red Sticks." Creek leaders such as William Weatherford (Red Eagle), Peter McQueen, and Menawa, who had been allies of the British during the War of 1812, violently clashed with other chiefs of the Creek Nation over white encroachment on Creek lands and the "civilizing" programs administered by U.S. Indian Agent Benjamin Hawkins. In the Creek War, a theatre of the War of 1812, Jackson defeated the Red Stick Creeks at the Battle of Horseshoe Bend. Jackson was aided by members of the Southern Creek Indian Band, who had requested Jackson's aid in putting down what they considered to be the "rebellious" Red Sticks, and some Cherokee Indians, who also sided with the Americans. 800 Northern Creek Band "Red Sticks" Indians were massacred. Jackson spared Weatherford's life from any acts of vengeance. Sam Houston and David Crockett, later to become famous themselves in Texas, served under Jackson at this time. Following the victory, Jackson imposed the Treaty of Fort Jackson upon both his Northern Creek enemy and Southern Creek allies, wresting 20 million acres (81,000 km²) from all Creeks for white settlement. Jackson's service in the War of 1812 was conspicuous for its bravery and success. He was a strict officer, but was popular with his troops. It was said he was "tough as old hickory" wood on the battlefield, which gave him his nickname. The war, and particularly his command at the Battle of New Orleans on January 8, 1815, made his national reputation. He advanced in rank to Major General. In the battle, Jackson's 6,000 militiamen behind barricades of cotton bales opposed 12,000 British regulars marching across an open field, led by General Edward Pakenham. The battle was a total American victory. The British had over 2,000 casualties to Jackson's 8 killed and 58 wounded or missing. Jackson served in the military again during the First Seminole War when he was ordered by President James Monroe in December 1817 to lead a campaign in Georgia against the Seminole and Creek Indians. Jackson was also charged with preventing Spanish Florida from becoming a refuge for runaway slaves. Critics later alleged that Jackson exceeded orders in his Florida actions, but Monroe and the public wanted Florida. Before going, Jackson wrote to Monroe, "Let it be signified to me through any channel... that the possession of the Floridas would be desirable to the United States, and in sixty days it will be accomplished." Monroe gave Jackson orders that were purposely ambiguous, sufficient for international denials. Jackson's Tennessee volunteers were attacked by Seminoles, but this left their villages vulnerable, and Jackson burned them and their crops. He found letters that indicated that the Spanish and British were secretly assisting the Indians. Jackson believed that the United States would not be secure as long as Spain and Great Britain encouraged American Indians to fight and argued that his actions were undertaken in self-defense. Jackson captured Pensacola, Florida with little more than some warning shots and deposed the Spanish governor. He illegally tried, and then captured and executed two British subjects, Robert Ambrister and Alexander Arbuthnot who had been supplying and advising the Indians. Jackson's action also struck fear into the Seminole tribes as word of his ruthlessness in battle spread. This also created an international incident, and many in the Monroe administration called for Jackson to be censured. However, Jackson's actions were defended by Secretary of State John Quincy Adams. When the Spanish minister demanded a "suitable punishment" for Jackson, Adams wrote back "Spain must immediately [decide] either to place a force in Florida adequate at once to the protection of her territory, ... or cede to the United States a province, of which she retains nothing but the nominal possession, but which is, in fact, ... a post of annoyance to them." Adams used Jackson's conquest, and Spain's own weaknesses, to convince the Spanish (in the Adams-Onís Treaty) to cede Florida to the United States. Jackson was subsequently named its territorial governor. "I recall with pleasure the remembrance of our joint labors while in the Senate together in times of great trial and of hard battling, battles indeed of words, not of blood, as those you have since fought so much for your own glory & that of your country; with the assurance that my attamts continue undiminished, accept that of my great respect & consideration." "I feel much alarmed at the prospect of seeing General Jackson President. He is one of the most unfit men I know of for such a place. He has had very little respect for laws or constitutions, and is, in fact, an able military chief. His passions are terrible. When I was President of the Senate he was a Senator; and he could never speak on account of the rashness of his feelings. I have seen him attempt it repeatedly, and as often choke with rage. His passions are no doubt cooler now; he has been much tried since I knew him, but he is a dangerous man." During his first run for the presidency in 1824, Jackson received a plurality of both the popular and electoral votes. Since no candidate received a majority, the election decision was given to the House of Representatives, which chose John Quincy Adams as president in 1825. Jackson denounced it as a " corrupt bargain" because House Speaker Henry Clay gave his votes to Adams, who then appointed Clay Secretary of State. Jackson later called for the abolishment of the Electoral College. Jackson's defeat burnished his political credentials, however, since many voters believed the "man of the people" had been robbed by the "corrupt aristocrats of the East." The Tennessee legislature again nominated Jackson for the presidency. He resigned from United States Senate in 1825. Jackson allied himself with Vice President John C. Calhoun, Martin Van Buren, and former supporters of William H. Crawford; together they built a coalition that handily defeated the reelection of John Quincy Adams in 1828. His supporters called themselves "Jackson Men," or Jacksonians. 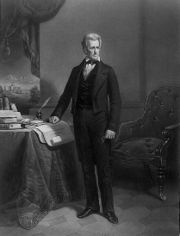 When Jackson became President, he implemented the theory of rotation in office, declaring it "a leading principle in the republican creed." He believed that rotation in office would prevent the development of a corrupt civil service. On the other hand, Jackson's supporters wanted to use the civil service to reward party loyalists to make the party stronger. In practice, this meant replacing civil servants with friends or party loyalists into those offices. However, contrary to popular belief, the Spoils System, as the rotation in office system was called, did not originate with Jackson. It originated under Thomas Jefferson when he removed Federalist office-holders after becoming president. Also, Jackson did not out the entire civil service. At the end of his term, Jackson had only dismissed less than twenty percent of the original civil service. While Jackson did not start the "spoils system", he did indirectly encourage its growth for many years to come. 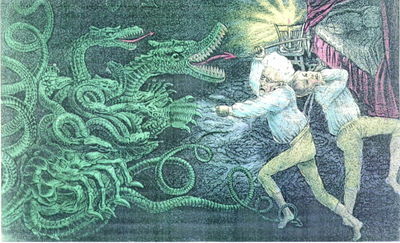 It exposed the government to control by "foreign interests"
Jackson followed Jefferson as a supporter of the ideal of an "agricultural republic" and felt the bank improved the fortunes of an "elite circle" of commercial and industrial entrepreneurs at the expense of farmers and laborers. After a titanic struggle, Jackson succeeded in destroying the bank by vetoing its 1832 re-charter by Congress and by withdrawing U.S. funds in 1833. The bank's money-lending functions were taken over by the legions of local and state banks that sprang up feeding an expansion of credit and speculation; the commercial progress of the nation's economy was noticeably dented by the resulting failures. The U.S. Senate censured Jackson on March 27, 1834 for his actions in defunding the Bank of the United States; the censure was later expunged when the Jacksonians had a majority in the Senate. 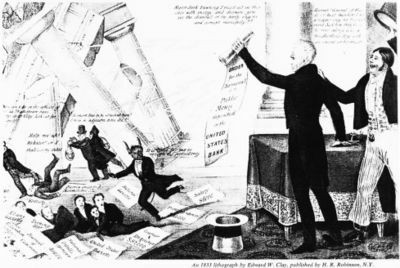 Another notable crisis during Jackson's period of office was the " nullification crisis," or "secession crisis," of 1828 – 1832, which merged issues of sectional strife with disagreements over tariffs. Critics alleged that high tariffs (the " Tariff of Abominations") on imports of common manufactured goods made in Europe made those goods more expensive than ones from the northern U.S., thus raising the prices paid by planters in the South. Southern politicians thus argued that tariffs benefited northern industrialists at the expense of southern farmers. The issue came to a head when Vice President John C. Calhoun, in the South Carolina Exposition and Protest of 1828, supported the claim of his home state, South Carolina, that it had the right to "nullify"—declare illegal—the tariff legislation of 1828, and more generally the right of a state to nullify any Federal laws which went against its interests. Although Jackson sympathized with the South in the tariff debate, he was also a strong supporter of a strong union, with considerable powers for the central government. Jackson attempted to face Calhoun down over the issue, which developed into a bitter rivalry between the two men. Particularly infamous was an incident at the April 13, 1830 Jefferson Day dinner, involving after-dinner toasts. Jackson rose first and voice booming, and glaring at Calhoun, yelled out "Our federal Union: IT MUST BE PRESERVED! ", a clear challenge to Calhoun. Calhoun glared at Jackson and yelled out, his voice trembling, but booming as well, "The Union: NEXT TO OUR LIBERTY, MOST DEAR!" In response to South Carolina's threat, Congress passed a " Force Bill" in 1833, and Jackson vowed to send troops to South Carolina in order to enforce the laws. In December 1832, he issued a resounding proclamation against the "nullifiers," stating that he considered "the power to annul a law of the United States, assumed by one State, incompatible with the existence of the Union, contradicted expressly by the letter of the Constitution, unauthorized by its spirit, inconsistent with every principle on which it was founded, and destructive of the great object for which it was formed." South Carolina, the President declared, stood on "the brink of insurrection and treason," and he appealed to the people of the state to reassert their allegiance to that Union for which their ancestors had fought. Jackson also denied the right of secession: "The Constitution...forms a government not a league.... To say that any State may at pleasure secede from the Union is to say that the United States is not a nation." The crisis was resolved when Jackson sent warships to Charleston, South Carolina and enforced Congress acts through the Force Bill. Tariffs gradually lowered until 1842. Passage of the Force Bill depended on the vote of Henry Clay. Clay would finally yield to those urging him to save the day. He introduced a plan to reduce the tariff gradually until 1842, by which time no rate would be more than 20 percent. The Compromise Tariff of 1833 was to be a resolution to the Nullification Crisis. On March 1, 1833 Congress passed the Force Bill and the compromise tariff and Jackson signed both. The South Carolina Convention then met and rescinded its nullification ordinance. The Force Bill was then nullified because Jackson no longer had a need for it. Henry Clay had saved the day. Perhaps the most controversial aspect of Andrew Jackson's presidency was his policy regarding American Indians. Jackson was a leading advocate of a policy known as " Indian Removal," signing the Indian Removal Act into law in 1830. The Act authorized the President to negotiate treaties to purchase tribal lands in the east in exchange for lands further west, outside of existing U.S. state borders. According to biographer Robert V. Remini, Jackson promoted this policy primarily for reasons of national security, seeing that Great Britain and Spain had recruited Native Americans within U.S. borders in previous wars with the United States. According to historian Anthony Wallace, Jackson never publicly advocated removing American Indians by force. Instead, Jackson made the negotiation of treaties priority: nearly seventy Indian treaties—many of them land sales—were ratified during his presidency, more than in any other administration. 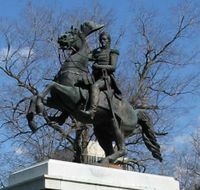 Statue of Andrew Jackson in Nashville, Tennessee. The Removal Act was especially popular in the South, where population growth and the discovery of gold on Cherokee land had increased pressure on tribal lands. The state of Georgia became involved in a contentious jurisdictional dispute with the Cherokees, culminating in the 1832 U.S. Supreme Court decision ( Worcester v. Georgia) that ruled that Georgia could not impose its laws upon Cherokee tribal lands. About this case, Jackson is often quoted as having said, "John Marshall has made his decision, now let him enforce it!" Jackson probably never said this; the popular story that Jackson defied the Supreme Court in carrying out Indian Removal is untrue. Instead, Jackson used the Georgia crisis to pressure Cherokee leaders to sign a removal treaty. A faction of Cherokees led by Jackson's old ally Major Ridge negotiated the Treaty of New Echota with Jackson's administration, a document which was rejected by most Cherokees. The terms of the treaty were strictly enforced by Jackson's successor, Martin Van Buren, which resulted in the deaths of over 4000 Cherokee on the " Trail of Tears." In all, more than 45,000 American Indians were relocated to the West during Jackson's administration. During this time, the administration purchased about 100 million acres (400,000 km²) of Indian land for about $68 million and 32 million acres (130,000 km²) of western land. Jackson was criticized at the time for his role in these events, and the criticism has grown over the years. Remini characterizes the Indian Removal era as "one of the unhappiest chapters in American history." On January 30, 1835 an unsuccessful attack occurred in the United States Capitol Building; it was the first assassination attempt made against an American President. One Richard Lawrence approached Jackson and fired two pistols, which both misfired. Jackson proceeded to attack Lawrence with his cane, prompting his aides to restrain him. As a result, Jackson's statue in the Capitol Rotunda is placed in front of the doorway in which the attempt occurred. Lawrence was later found to be mentally ill.
Official White House portrait of Jackson. Jackson met Rachel after her first husband, Colonel Lewis Robards, left her to get a divorce. They fell in love and quickly married. Robards returned two years later without ever having obtained a divorce. Rachel quickly divorced her first husband and then legally married Jackson. This remained a sore point for Jackson who deeply resented attacks on his wife's honor. Jackson fought 103 duels, many nominally over his wife's honour. Charles Dickinson, the only man Jackson ever killed in a duel, had been goaded into angering Jackson by Jackson's political opponents. Fought over a horse-racing debt and an insult to his wife on May 30, 1806, Dickinson shot Jackson in the ribs before Jackson returned the fatal shot. The bullet that struck Jackson was so close to his heart that it could never be safely removed. Jackson had been wounded so frequently in duels that it was said he "rattled like a bag of marbles." . At times he would cough up blood, and he experienced considerable pain from his wounds for the rest of his life. Rachel died of an unknown cause two months prior to Jackson taking office as President. Jackson blamed John Quincy Adams for Rachel's death because the marital scandal was brought up in the election of 1828. He felt that this had hastened her death and never forgave Adams. Jackson had two adopted sons, Andrew Jackson Jr., the son of Rachel's brother Severn Donelson, and Lyncoya, a Creek Indian orphan adopted by Jackson after the Creek War. Lyncoya died in 1828 at age 16, probably from pneumonia or tuberculosis. The Jacksons also acted as guardians for eight other children. John Samuel Donelson, Daniel Donelson, and Andrew Jackson Donelson were the sons of Rachel's brother Samuel Donelson who died in 1804. Andrew Jackson Hutchings was Rachel's orphaned grand nephew. Caroline Butler, Eliza Butler, Edward Butler, and Anthony Butler were the orphaned children of Edward Butler, a family friend. They came to live with the Jacksons after the death of their father. The widower Jackson invited Rachel's niece Emily Donelson to serve as hostess at the White House. Emily was married to Andrew Jackson Donelson, who acted as Jackson's private secretary. The relationship between the President and Emily became strained during the Petticoat Affair, and the two became estranged for over a year. They eventually reconciled and she resumed her duties as White House hostess. Sarah Yorke Jackson, the wife of Andrew Jackson Jr., became co-hostess of the White House in 1834. It was the only time in history when two women simultaneously acted as unofficial First Lady. Sarah took over all hostess duties after Emily died from tuberculosis in 1836. Jackson remained influential in both national and state politics after retiring to " The Hermitage," his Nashville home, in 1837. Though a slave-holder, Jackson was a firm advocate of the federal union of the states, and declined to give any support to talk of secession. Jackson was a lean figure standing at 6 feet, 1 inch (1.85 m) tall, and weighing between 130 and 140 pounds (64 kg) on average. Jackson also had an unruly shock of red hair, which had completely grayed by the time he became president at age 61. He had penetrating deep blue eyes. Jackson was one of the more sickly presidents, suffering from chronic headaches, abdominal pains, and a hacking cough, caused by a musket ball in his lung which was never removed, that often brought up blood and sometimes even made his whole body shake. After retiring to Nashville, he enjoyed eight years of retirement and died at the Hermitage on June 8, 1845 at the age of 78, of chronic tuberculosis, " dropsy" and heart failure. 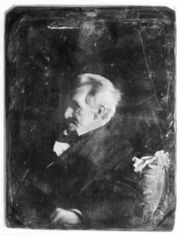 In his will, Jackson left his entire estate to his adopted son, Andrew Jackson Jr., except for specifically enumerated items that were left to various other friends and family members. Jackson left several slaves to his daughter-in-law and grandchildren. Memorials to Jackson include a set of three identical equestrian statues located in different parts of the country. 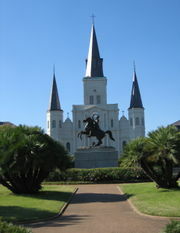 One is in Jackson Square in New Orleans, Louisiana. Another is in Nashville on the grounds of the Tennessee State Capitol. The other is in Washington, D.C. near the White House. Numerous counties and cities are named after him, including Jacksonville, Florida, Jackson, Michigan, Jackson, Mississippi, Jackson, Missouri, Jackson, Tennessee, Jackson County, Florida, and Jackson County, Missouri. Jackson's portrait appears on the American twenty dollar bill. He has appeared on $5, $10, $50, and $10,000 bills in the past, as well as a Confederate $1,000 bill. The story of Andrew and Rachel Jackson's life together was told in Irving Stone's best-selling 1951 novel The President's Lady, which was made into the 1953 film of the same title, starring Susan Hayward, Charlton Heston, John McIntire, and Carl Betz and directed by Henry Levin. The relationship between the two was also the basis of a successful documentary by the Public Broadcasting Service, called Rachel and Andrew Jackson: A Love Story. Heston played Jackson in the 1958 version of The Buccaneer, a film about the role of pirate Jean Lafitte in the Battle of New Orleans. Hugh Sothern played Jackson in the original 1938 version of the film. During Jackson's Administration, the U.S Government was, for the first and last time, debt free. During the 1828 election, his opponents referred to him as a " Jackass." Jackson liked the name and used the jackass as a symbol for a while, but it died out. However, it later became the symbol for the Democratic Party. Andrew Jackson was the first president to be born in a log cabin. He also was the first president to ride a railroad train while in office. Was the only U.S. president to be a prisoner of war. Jackson held an open house party where a 1,400 pound (635 kg) wheel of cheddar cheese was served as refreshment. The cheese was consumed in two hours. Of the first seven presidents, Jackson was the last of five Veterans of the American Revolution to become President (Washington and Monroe were in the Continental Army; Jefferson and Madison were Colonels in the Virginia Militia). Jackson was the first president to be the target of a known assassination attempt (see above, " Assassination Attempt"). Andrew Johnson, Lincoln's vice-president, greatly admired Jackson and wanted to be just like him when Johnson became president after Lincoln was assassinated. Jackson disliked paper money, as he preferred coined money instead, and ironically, he is featured on the U.S. $20 bill. At President Andrew Jackson's funeral in 1845 his pet parrot was removed for swearing.